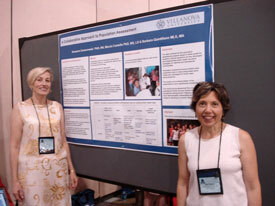 Barbara Quintiliano, M.L.S., M.A., instructional design librarian, presented the poster session “A Collaborative Approach to Population Assessment,” with College of Nursing faculty colleagues Marcia Costello, Ph.D., R.D., L.D., and Suzanne Zamerowski, Ph.D., R.N., at the National League for Nursing Education Summit, held at the Pennsylvania Convention Center in Philadelphia, on Sept. 24 and 25. The poster illustrated the collaboration between the instructional librarian and the course faculty that led to the creation of a matrix with hypertext links to important data sources. The population assessment matrix enabled students in the capstone Nursing 4102 course, “Nursing and Health Promotion,” to locate online international, national, state and local health data quickly and efficiently, affording these students more time to interact directly with the populations being assessed. The data collected for the population assessment projects helped to guide the students’ clinical experience as they developed and implemented public health education strategies for national and international communities. Collaboration is what the library does best and Barbara is one of the best collaborators I know. The matrix was a great idea!